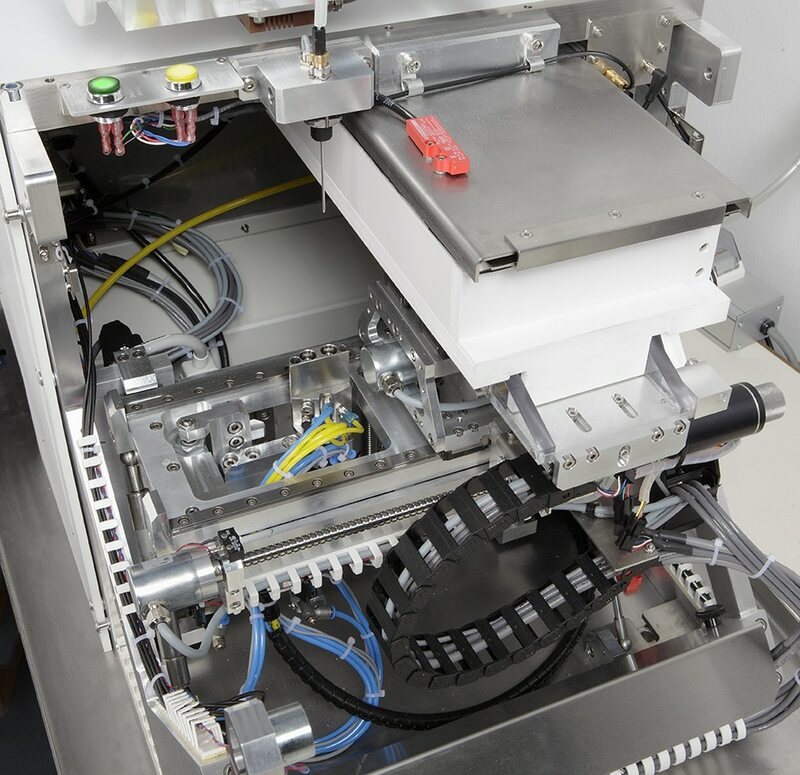 BioSAXSTM is an automatic sample changer designed to support biological SAXS & WAXS experimentations on Synchrotron beamlines. 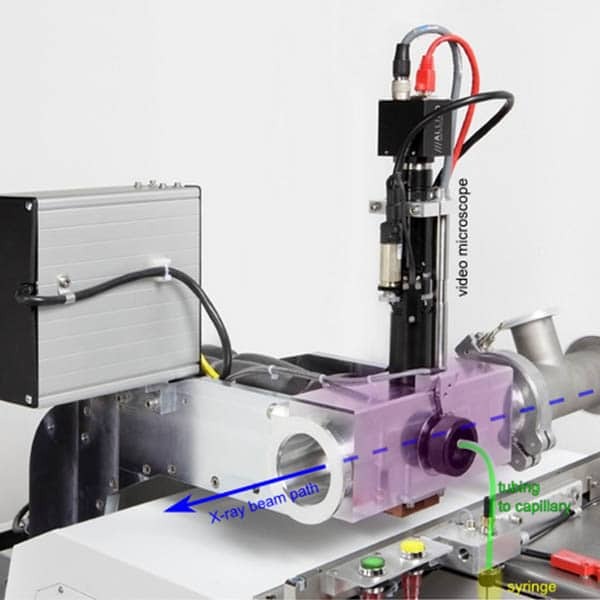 This in-solution Biological Small & Wide angle X-ray Scattering (BioSAXS/WAXS) system allows native macromolecules to be studied, ranging from individual proteins to large complexes, in solution and under nearly physiological conditions. It allows the automatic transfer of the samples from a storage unit to an exposure unit in a highly controlled environment. The sample storage unit can be loaded with a standard SBS well plate for sample solutions and one Eppendorf strip for buffer solutions. The SBS plate type is recognized automatically. The height of sample liquid within the individual well plates is recognized automatically. The entire cycle, including sample loading, unloading and capillary cleaning is done within 50 seconds. This performance is reached for all sample viscosities: the BioSAXS sample changer automatically adjusts the transfer to the sample viscosity in order to achieve a duty cycle close to 50 seconds. 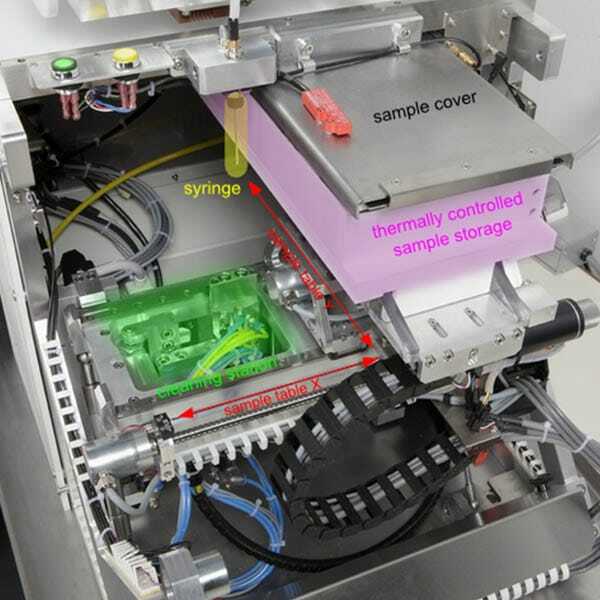 The user can set the sample temperature for two environments: 4 to 40°C (±1°C) for the sample storage unit, and 2 to 60°C (±1°C) for the sample exposure unit. The sample transfer process is adapted to the selected viscosity, i.e. a BioSAXS algorithm calculates sample pipetting volumes according to the selected viscosity regime. The temperature regulated sample storage slot can receive numerous types of sample holders: 96-well and deep-well SBS microplates, strips of wells (4 x 8 wells Eppendorf strips) and individual wells (4 x 3 individual 1.5 mL wells). Furthermore, it is possible to fit the BioSAXS automatic sample changer for another type of sample holder. Please contact us to estimate the technical possibilities. 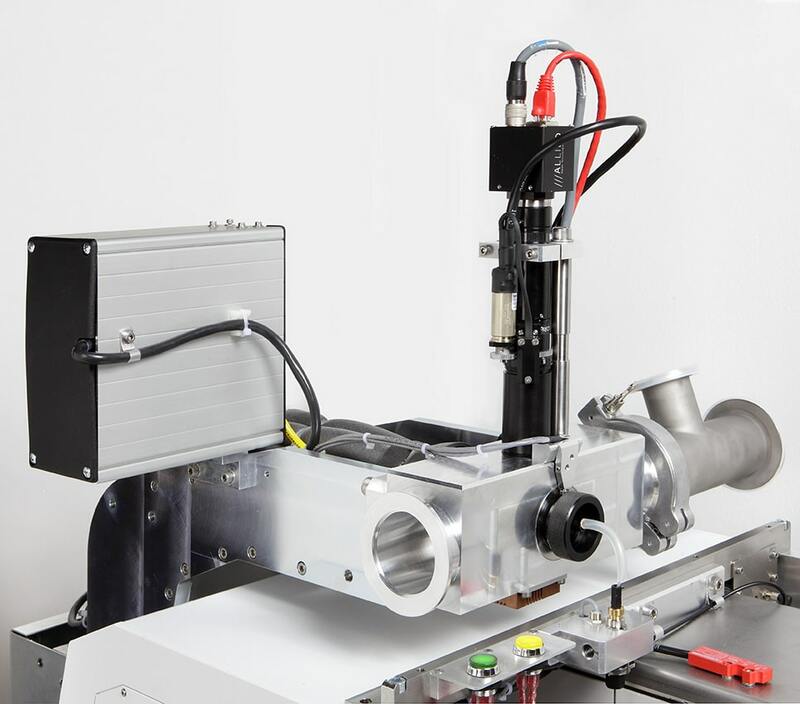 The sample holders can be installed or removed by opening the top cover of the BioSAXS Sample Changer Robot. The Sample Exposure Unit (SEU) is composed of an exposure cell housing, a video microscope and a Pipetting System. The Exposure Cell housing is a temperature regulated and vacuum-tight chamber that hosts the exposure cell, a quartz capillary. The capillary is mounted in a metallic support, the so-called capillary pod. The capillary pod can be exchanged within minutes, making the Sample Exposure Unit maintenance friendly. The video microscope is associated with a lighting system that allows capillary and sample visualization. The video microscope images are exploited by the control software for most of the automated functions and calibrations; it also offers direct sample visualization to the user. The liquid samples are kept inside the temperature controlled sample storage container (violet). It moves horizontally (red arrows) and positions under the syringe (i.e. pipetting needle) for sample loading. The robot automatically fits the syringe to the type of sample holder used. The user has simply to launch the sample loading process. After sample disposal the cleaning station (green) moves up in order to clean the syringe, the capillary and any of the connecting tubing. During the sample loading process the liquid sample passes through the syringe (yellow) and very short tubing (green) before arriving in the exposure head (violet). The capillary and its content are visualized in situ by means of the video microscope (black). After data collection the irradiated sample is automatically send to the sample disposal container. However, BioSAXS can also be set to recover the sample and bring it back to the sample storage unit. Thus, the user can recover the sample to its initial place or in any other of the available sample wells. A direct consequence of the sample recovery functionality is the possibility of in situ sample mixing. BioSAXS can be equipped with a retractable SAXS/WAXS Sample Exposure Unit. This is interesting if users want to use other types of sample supports, e.g. microfluidic plates. Don't stay with question, ask for answers!